I always want to take something that I love and know is not the healthiest, and transform it into something that is guilt free. 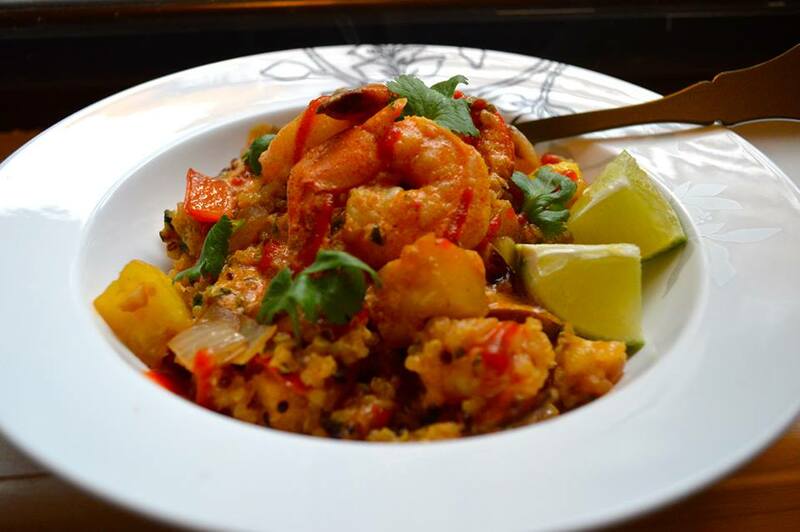 This recipe fuses different flavors together of red curry and coconut milk with pineapple, shrimp, and quinoa. The result is a delicious, healthy, and satisfying meal that you will want to make time and time again. The best part is you can change out different ingredients to make different meals. Change out the shrimp for chicken, the quinoa for brown rice, and the curry sauce for ponzu and you have another great meal using the same methodology. Cook the quinoa first, bring 1 T of coconut oil to heat in a large covered pot, add the quinoa stirring to slightly toast. Pour over stock or water and cook covered for 15-20 minutes until soft, stirring every 5 minutes. Season with salt and pepper. Turn heat off and set aside. Prepare all your vegetables and measure out the rest of your ingredients. In a large saute pan add 1T of coconut oil, bring to heat and add your onions. Sauté onions for 2-3 minutes until softened, add your garlic. Next add your bell pepper and cook for 2 minutes. 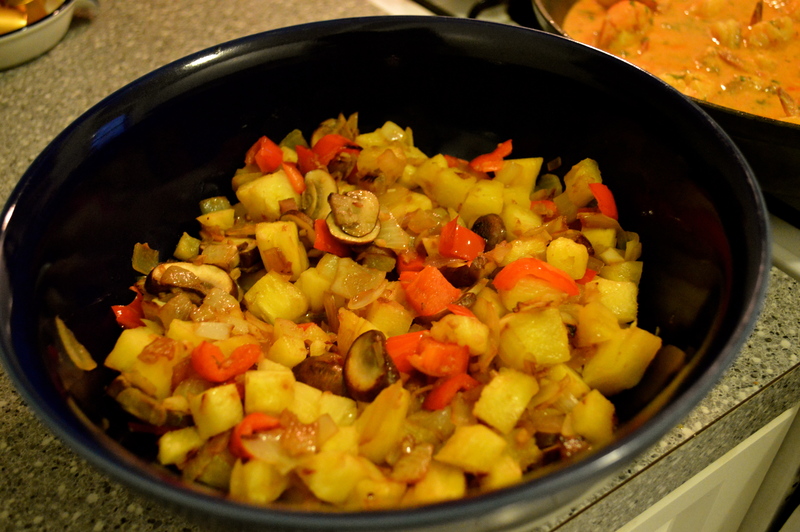 Next add your mushrooms and cook on high heat until softened. Add your pineapple next and cook for 2 minutes. Season vegetables with salt and pepper. Remove contents of pan to a bowl and place pan back on burner. Add your final amount of coconut oil, and bring to high heat. Season shrimp with salt pepper and a touch of sesame oil. Add shrimp to pan and cook on high heat for 2 minutes to achieve so color and browning. 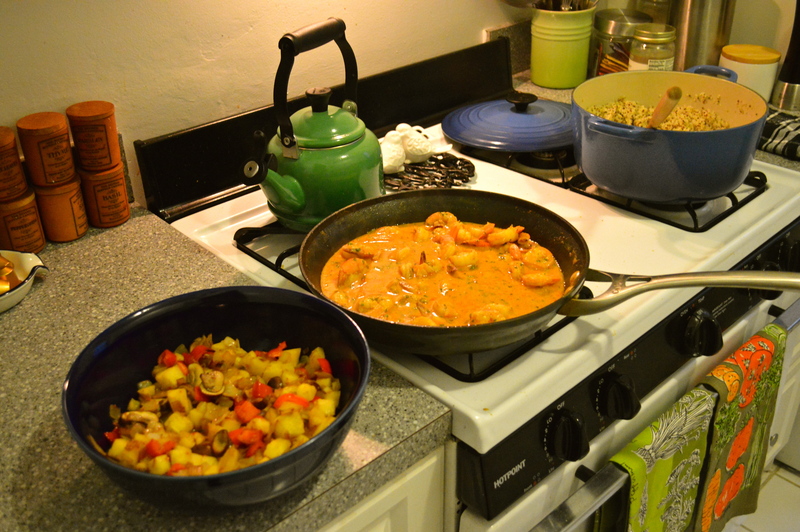 Add your red curry paste and coat the shrimp. Add the soy sauce and sesame oil. Cook for 2 minutes and then add the coconut milk. Stir and scrape the pan to get all flavorings up. 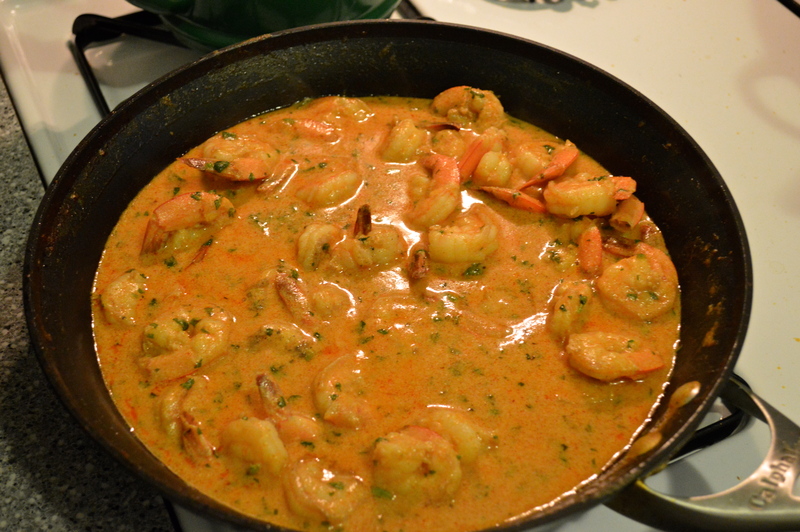 Turn heat down and simmer for 3-4 minutes until shrimp are nice and tender and sauce has thickened. Add your mint and cilantro as well as lime juice. Add 2 T of sriracha to the sauce and stir to combine. Taste for seasoning, can sweeten here if you desire or keep as is. Now you have three components. You can mix them all together or if you want to achieve the “fried” rice aspect of the dish. Place a sauté on high heat, add a scoop of quinoa and start to crisp up. 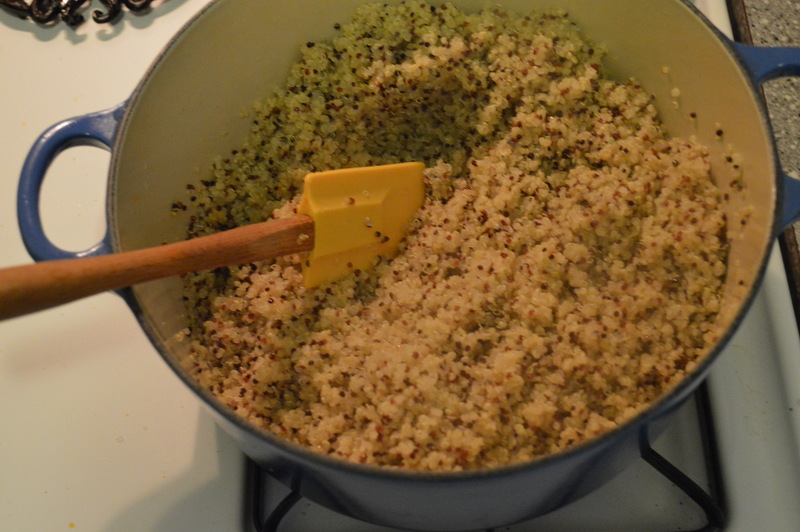 On the quinoa is crispy, add a scoop of vegetable mixture. 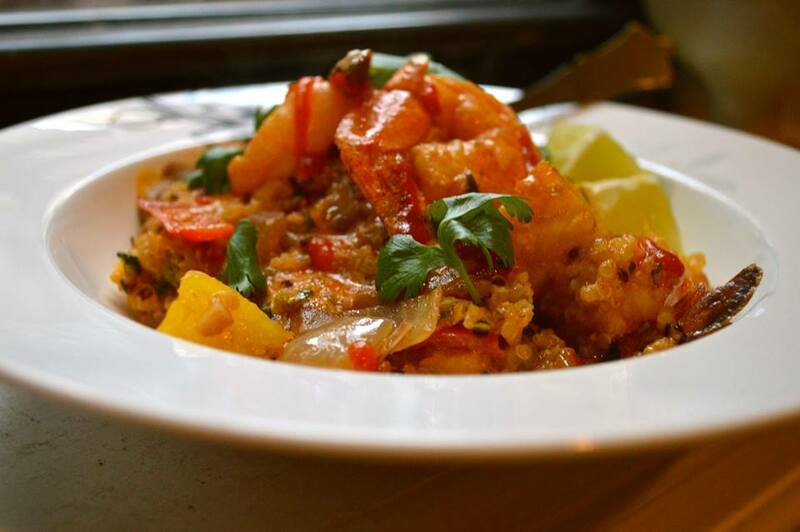 Cook for 1 minute, then add a scoop of shrimp curry. Cook for an additional 1 minute and serve hot, top with more lime, sriracha and chopped cilantro. This dish is absolutely delicious and although there are steps involved it is well worth i! Remember healthy doesn’t have to mean bland. Today’s post is brought to you by the letter “D” for delicious. This dish literally takes 15 minutes to prepare and so deliciously healthy and satisfying you will make it time and time again. Place a large sauté pan on high heat. Prep all your ingredients and have them ready to go for a quick cooking session. Mince the onion, halve your cherry tomatoes, mince the garlic. Season your salmon with the salt and pepper. Mix together the two spices and set aside. Once the pan is smoking hot, add 1 T of coconut oil. Remove from heat and place your salmon skin down into the pan. Hold the fish down so the skin is completely in contact with the pan. You can do this with your hand, a spatula or another pan. Place the pan back on the stove and reduce heat to medium high. Continue to cook until skin is golden brown and crispy. Remove your salmon with tongs and place into spice mixture. Cover both sides and return to the pan. Brown both sides of salmon with spice mixture. Should take 2-3 minutes per side. Remove salmon to the side to rest a moment. Add 1/2 T of coconut oil to the pan, and add the onion and garlic. Scrape the pan to remove all bits of caramelized salmon and spices. Continue to cook on medium high until onion has started to soften, about 3 minutes. Add your tomatoes and turn the heat up, add the juice of half a lime, season with remaining salt and pepper. Cook for a few moments to soften tomatoes and add your hot sauce. In your serving bowl, add lettuce tossed with remaining lime juice, coconut oil and seasoned with salt and pepper. Remove sauté from the heat. 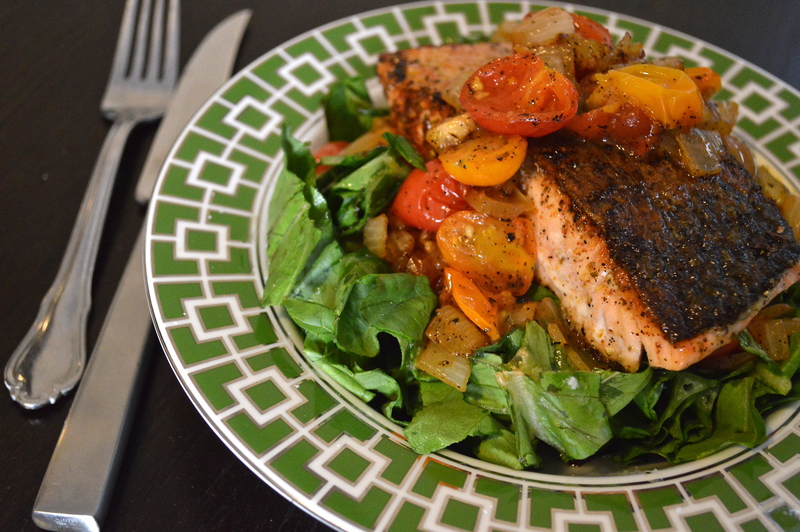 Place your Salmon atop the greens and cover with the sauté. The salmon will start to wilt the greens and sauté will mix with the seasoning on the salmon and create magic. Absolutely delicious and easy, healthy meal that you can interchange with many different flavorings. I hope you try this out! I am not a baker, that is for sure. I do however love to have guests over, and to entertain. This last weekend we had some friends visiting us in Philadelphia from New York City and I wanted them to have a sweet treat in the morning. Not sure what to make, and I scoured the fridge and freezer. I like to keep a package of puff pastry in the freezer, I use it for all types of appetizers and entrees, and desserts as well. I decided to make a breakfast treat with puff pastry. 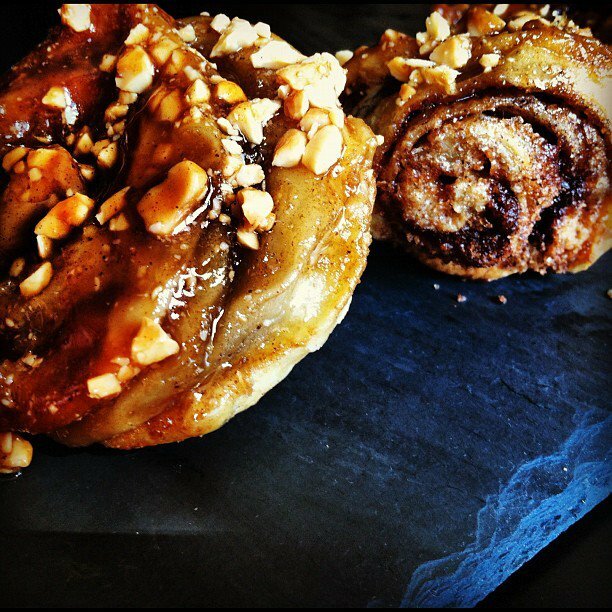 Sticky buns are traditionally made with a yeast dough, and take a good amount of time to prepare. Using puff pastry, I get a very similar effect with about a fourth of the work. Try this recipe out, its super simple and satisfying! 1: In a small bowl mix together the two sugars. Take half the sugar mixture and mix with one stick softened butter. Add the vanilla, and 1 T cinnamon. 2: Take the other half of the sugar mixture and add the other T of cinnamon. 3: In a small baking dish, smear the butter mixture evenly across the bottom. 4: Take your finely chopped cashews and distribute them evenly over the butter mixture, patting them in. 5: Now unwrap your puff pastry, there ill be two sheets. Place them on a flat surface, and place one down and then the other sheet overlapping the edge by half an inch. Press firmly on the edge to make one long sheet of pastry. 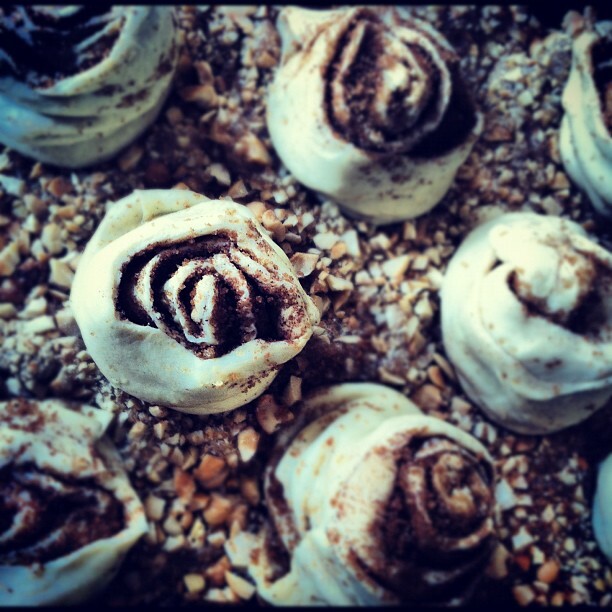 6: Sprinkle the entire amount of sugar and cinnamon mixture across the pastry dough, covering it entirely. 7: Gently start rolling the bottom of the dough; roll very tightly to keep all the sugar in and get the classic cinnamon bun look. 8: Keep rolling until the whole sheet is rolled tightly into a cylinder. 9: Cut the cylinder into 8 equal portions. 10: Place the rolls into the baking dish, spaced 1 1/2 inches apart. 11: Gently press them down into the butter mixture. 12: Place into a 375° oven for about 45 -50 minutes, you want to check after 30 minutes to make sure that they are browning evenly, rotate them if need be. 13: Make sure that the dough is completely cooked through, if still doughy cook for an additional 10 minutes. 14: Let cool for 20 minutes, and then turn the dish over to reveal the chewy caramel on the other side of the buns. This recipe is delicious and can be make in advance or morning of. They are great for breakfast or as a dessert. Thank you for reading, I hope you try these out!